African elephants: Should trophy ban be lifted? Big-game hunting is an emotional subject, said Neel V. Patel in Slate.com. But as counterintuitive as it sounds, lifting this ban could actually help save elephants. Wealthy Western hunters pay more than $30,000 for hunting excursions and up to $18,500 more for a trophy permit—money that can be poured back into local conservation efforts to protect elephant habitats and fight poaching. 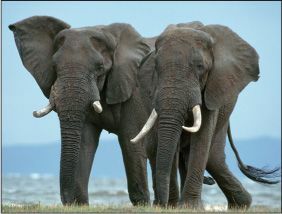 “Animals, it is important to note, are not romanticized in Africa,” said Monica Showalter in AmericanThinker.com. Elephants, lions, and other big game are viewed as either objects of terror or a muchneeded source of local income. Without trophy hunters like Donald Jr., there would be no hunting industry, which pays many Africans’ wages, and no funding for anti-poaching efforts that protect the overall elephant population.